Sent to London by his Uncle in order to broaden his horizons before ruling his birth nation of Bechuanaland, Seretse Khama (Oyelowo) is a pragmatic soul, completely aware of the challenges faced because of the colour of his skin, a situation made much worse, on a political, national, and societal level, when he falls in love with Ruth (Pike), an office girl with both an open mind and heart. When he’s summoned home to fulfil his duties, Seretse, reluctant to abandon his newfound love, asks for her hand in marriage, and with it comes widespread condemnation from his own people, and the British government, the mouthpiece of who is Sir Alistair Canning (Jack Davenport), who are keen to maintain political relationships with neighbouring South Africa, a country on the verge of initiating Apartheid. With no choice but to travel to Bechuanaland, Seretse and Ruth arrive as King and Queen, rulers of a nation reluctant to accept an interracial marriage at a time when black and white segregation is becoming more prevalent. As a history lesson, “A United Kingdom” is a resonant eye-opener, one of those stories which you cannot believe to be true; even in a modern age in which racial inequality is constantly on the breaking news ticker of rolling media, you can’t imagine it ever being this draconian. In that regard, David Oyelowo delivers another towering performance of controlled passion. With insurmountable obstacles testing his very humanity, he makes Seretse a powerful beacon of courage; rousing speeches, suppressed anger, and eyes on the precipice of tears, his rallying cry to the tribe during which he defends his love for his wife is the stuff of Oscar montages, something which surely will come to fruition after his Martin Luther King snub. It’s a shame then that by comparison the rest of the movie is so lightweight and inconsequential, completely fumbling the romance upon which the conflict is built. The relationship beats are just so generic and at odds with the weighty issues of the rest of the movie, that not for one minute do you believe in them as a couple, and subsequently the sacrifices they’re about to make. Two dances and 15 minutes into the movie there’s a marriage proposal, so lines such as “I’ve never wanted anything like I want this” just don’t ring true. 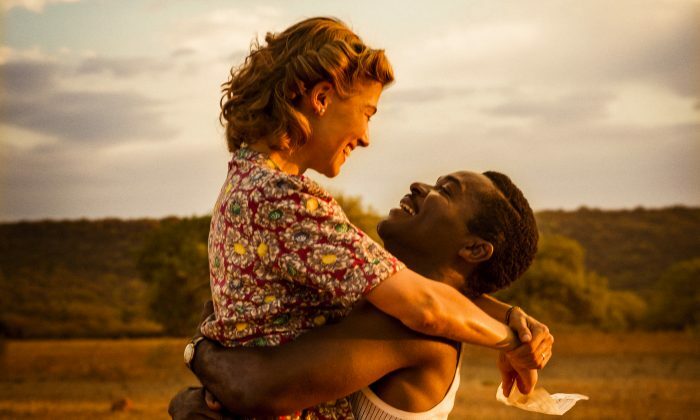 Only when the story shifts to Africa does the film find its feet, with Asante making the most of the stunning locales and seemingly endless horizon, but aside from a few pin-drop monologues by Oyelowo, “A United Kingdom” is underwhelming, awards baiting stuff.